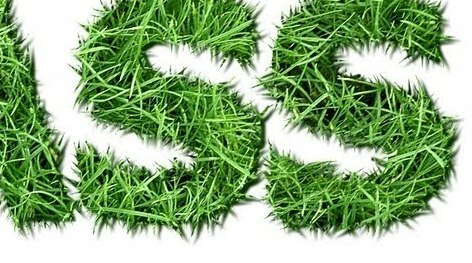 Here for creating Spectacular Grass Text Effect in Photoshop we need “grungy paper textures from Bittbox” And layer overlay with the 70% opacity with green color. After make it we have to found “lovely photo on Flickr of grass”. Adjust it with the previous background. Now it’s time to write something. Here after writing we see that it’s plain and not looking real. So we need to make it rough. For that we will use letter shape as rough guide and trace around the text. For this choose pen tool and walk out of the written text. And on each word individually trace on all of these word. Then double click on the path for the selection. Go to the grass layer and duplicate through pressing Ctrl+J. Here we have more grass for another word. Already we got our first word which is “A” from “ART”. It needs to make little dept. And finally the word is really set here. Then add some layer styling and three dimensional look. Set blend mode at screen, opacity at 13%, angle 19. Distance 11, size 14 and contour as invert. It will be in Satin. Then set “bevel and emboss” “structure” and “shading”. Into structure set style as inner bevel, technique – smooth, Depth 100%, direction up and soften 0 pixels. Into shading set angle 120 degree, altitude 30 degree, highlight overlay, opacity 16%,shadow mode multiply and opacity as 25%. Then duplicate this layer and delete layer style. So that we can add more styles and make more realistic looking. For that again change blending option and change its general blending, advanced blending and blend if gray. Also change drop shadow as structure and quality and Bevel and emboss: structure, shading. Using Light and Shade to Bring Text to Life cut the side of the letter. Like this way make other two words. Our tutorial is complete.